From the time she was eight, Naomi knew she wanted to be a midwife. She had heard a lot of stories and already experienced her first birth because her best friend’s mom was a midwife. 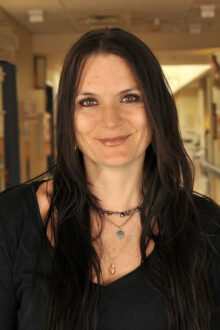 In 1996 Naomi moved to Taos to train through the Northern New Mexico Birth Center to become a licensed midwife. Once she received her licensure she worked part time as the home birth director and part time for Puentes before returning to school to become a registered nurse so she could become a certified nurse midwife. Her experiences have allowed her the opportunity to deliver babies in different settings. She says she believes that women should have choices as to where and how they give birth. She has found that she enjoys working in a hospital based practice because of the team work involved. She has had a great relationship with the OB/GYN’s as they have made the transition from mentor/teacher to colleagues seamless. Naomi has two children. She also has two dogs, four cats, and a tortoise. In her spare time she likes to play music, spend time in the mountains and camp. She stays healthy by mostly eating a plant based diet and exercising at least three days a week. She also believes having a sense of humor and laughing as much as possible are important to health. She enjoys working in Taos saying there’s no place like it. She says it is very accepting. Naomi received a Master of Science in Nursing from Frontier School of Midwifery and Nursing. She is a Board Certified Nurse Midwife.